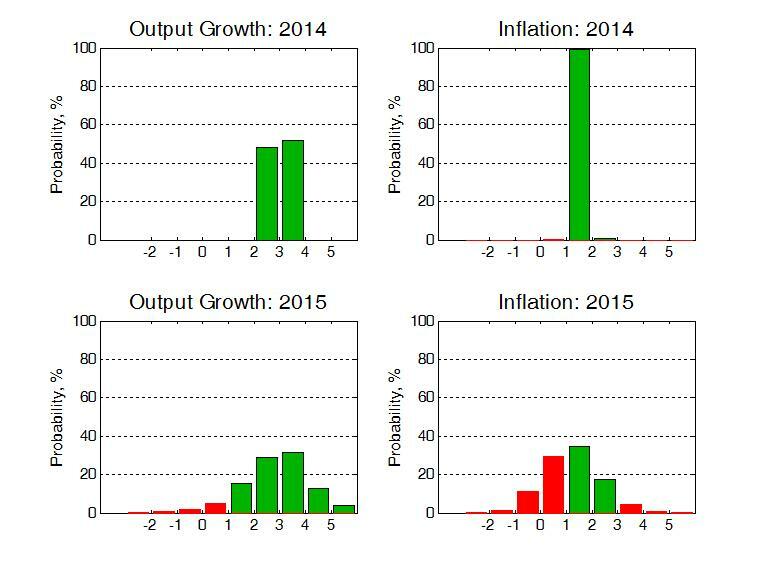 The figure below presents WBS’s latest (as of 26th November 2014) probabilistic forecasts for real GDP growth and inflation – for 2014 and 2015 – as histograms. Inspection of the figure reveals that the balance of probabilities is such that the economic recovery in the UK is set to continue through 2015. But, as the red columns indicate, the WBS forecasting system suggests that there remain downside risks to GDP growth next year with the forecast histogram skewed to the left. This long left “tail” to this histogram indicates that, despite expected growth of more than 3% in 2014, prospects for 2015 remain far from certain - with a 8% probability of “weak” growth of less than 1% (see Table 1 below). Table 1 shows that, despite the expected continuation of growth in 2015, there remains about a one-in-four chance that GDP growth will be less than 2%. This heightened uncertainty about the prospects for economic growth in 2015 implies that one cannot presume that annualised growth will pick up to historically “normal” levels of between 2% and 3% p.a.. The WBS forecasting system emphasises that the risks to a breach of the inflation target in 2015 remain high – close to a one-in-two chance. This is because the probability of inflation falling below 1% in 2015 has risen sharply from 13% a quarter ago - to the current expectation of 48% - as oil, food and import prices have fallen in recent months. Accordingly, we take the most recent forecasts from the IMF, the Bank of England and HMT’s Panel of Independent Forecasters. While the Bank of England does provide an explicit assessment of forecast uncertainties for the UK, via “fan charts”, the IMF and the HMT Panel provide point forecasts only. While the IMF, Bank of England and HMT Panel forecasts for GDP growth in 2015 fall close to the centre of the WBS forecasting system distribution, the IMF and the HMT Panel expect higher inflation outcomes than the WBS system. Inflation is therefore likely to fall below their expectations. The WBS forecasts thus emphasise forecast uncertainties; and provide a benchmark against which one can assess the plausibility of other forecasts. A note summarising the System, and evaluating its historical performance, is available at this link.